Dumbo, Brooklyn will be the neighborhood to host the debut Browse & Pick's fashion swaps! This summer, fashion swaps are invading the neighborhood of Dumbo in Brooklyn, New York. Browse & Pick has selected the iconic neighborhood to introduce their unique approach to clothing swaps and tickets are now on sale. “It was between Williamsburg and Dumbo all along. We were aware of the great community that exists in these areas and decided on Dumbo due to the venue we found," said Co-Founder David Badillo. Browse & Pick will be making their debut at the Dumbo Spot on Saturday, June 2, 2012. The Dumbo Spot is a 2,500 square foot loft and seemed to be an excellent choice to debut their fashion swaps. “We didn’t want to start out in a larger venue since we want to gradually work our way up to larger venues, but I love the ambience of the place and I’m excited to start,” said Co-Founder Ann Badillo. Along with their June date, David and Ann have also booked July 14th and August 18th to conclude their summer tour. For their July 14th date, they have reserved the Dumbo Loft to host the event. 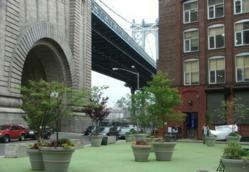 The Dumbo loft is a 3200 square foot venue, found in the heart of Dumbo, right next to the Manhattan Bridge. On August 18th they will wrap up their summer tour by returning to the Dumbo Spot. Browse & Pick’s fashion swap summer tour will feature their woman’s swap known as “Swap Rouge” and their children’s swap called “Swap-a-Coo.” They are also currently preparing the launch of their men’s fashion swap, “Swap Fraternity” will launch winter of 2013. Browse & Pick’s mission is committed to being one of the major leaders in eco fashion throughout the New York City area and educating the mainstream of the benefits of green fashion. Browse & Pick is based in Williamsburg, Brooklyn with future plans to expand their tours throughout New York City and other major cities throughout the United States.